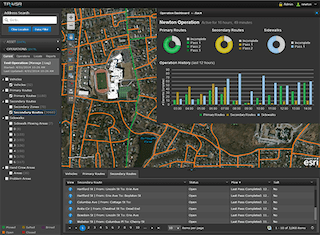 In an interview with Brian Berdel, CIO of McMahon Associates, Inc., a national Philadelphia-based engineering firm, he talked about the new release of their Traisr web-based infrastructure asset-management application that relies on a GIS to help users track, manage, maintain and report on vital assets — on the road or off. It is already being used by municipalities along the east coast. McMahon Associates officially launched Traisr at the Esri User Conference two weeks ago in San Diego. Traisr is being marketed to municipal governments and businesses that maintain vehicle fleets or have complex campuses to maintain, such as recreational facilities, landscaping companies, hospitals and utility operators. The tool can be used to allow municipalities to run more efficiently and save taxpayers’ dollars. It can be used to manage activities including pothole repair, traffic light maintenance, permitting and snow removal. There’s even a component that allows residents to report, take photos and upload them directly to the system – saving time and headaches when something in the township isn’t right. GISCafe Voice: Do you use your own in-house GIS or Esri’s GIS, or another? Brian Berdel: Our software is developed on a hybrid model that utilizes SQL Spatial, Esri ArcGIS Online and ArcGIS Server. GISCafe Voice: What does the integration with CAD and other systems look like? We use industry standard practices for data integration and have the ability to integrate with virtually any dataset or type. GISCafe Voice: Does it work on the cloud? GISCafe Voice: Can users use it in disconnected as well as connected modes? Work Centrl – Tracks time and materials and enables users to create, manage and maintain work orders. Operations Centrl – Uses GPS for live, real-time data to manage emergencies, deal with weather issues, track vehicles and report back to residents or customers. Permit Centrl – Tool for generating permits, enforcing compliance, issuing fines and planning inspections. If chosen, contractors and residents can also apply and pay for permits using this module. Citizen Centrl – Facilitates transparency between the user and its residents and clients. Users can share information with residents/clients and they can share issues, complete with geolocations and snapshots. Inspection Centrl – Schedules inspections and offers condition ratings; used for maintenance scheduling and risk assessment. Land Use Centrl – Offers parcel, zoning and land use planning data. Can be used to generate buffer zones around an entity(s) and then communicate with residents in that zone. This entry was posted on Wednesday, July 30th, 2014 at 3:06 pm. You can follow any responses to this entry through the RSS 2.0 feed. You can leave a response, or trackback from your own site.